For the challenging hike up to the Markovo Plateau and its highest peak you should schedule 2 days at least. The first day you will climb the plateau up to a height of about 1600 m. The second stage takes you from the plateau to the peak and back down to the lake. The steep ascent from the shores of Lake Baikal up to 1877 m above sea level asks for a good condition and will reward mountaineers with a great view over the whole of the peninsula, Barguzin and Tshivyrkuy Bay (Barguzinskiy, Tshivyrkuysky Zaliv), and the close-by Ushkani Islands, where the world's one and only freshwater seal population can be found. Should you be lucky to have a good view, you can even see the western shore of Lake Baikal and Olkhon Island as well as deep into the northern forests of Lake Baikal. The difficult accessibility and the therefore intact nature allow visitors to watch diverse species of birds and squirrels as well as numerous tracks of one of the 80 bears who live on the peninsula. BThe tour starts at the fork in the road to Kurbulik and the driveway to Glinka where generally you will be dropped off by public transport. Now it is about another 15 minutes to Glinka, a former complex of small lodges and a hotel, now burnt down and directly at the shore of the lake. The buildings remained are now used by fishermen. Before entering Glinka, you will pass a trail to the right which is the end of the tour. Behind Glinka starts a small path leading for two hours through mixed birch forests and constantly running along the shore. It also passes some nice potential camp spots. Finally you will reach Cape Makarova. After crossing a stream, but still before reaching the fishermen's camp at the headland, the path turns right into the forest. The trail marked with red tags now leads slowly uphill along the stream. It leads through mixed forest, with lots of tall pine trees, crosses an old streambed and then steeply leads uphill. Along the left slope it leads through the taiga, the stream still within the range of vision. About half an hour later the trail changes to the other side of the stream. This would be a good opportunity to fill up the stores of water for the ascent and the following day. The trail now leads through a valley, later through forests and then across meadows with high grass and ferns. When you reach a parting of the ways, keep on going uphill and you will soon meet the right trail. From now on the marking is not very good anymore. Across the boulder of the streambed it keeps on leading uphill. Stone cairns (little stone pyramids) are now the only signs which show that youre still on the right way. About one hour after you crossed the stream the most exhausting part begins. The trail now leads uphill very steep. 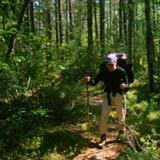 Try to follow the trail as long as possible even though you will probably have more and more difficulties to find it. It might be helpful to keep left to the crippled pines. But even when the trail disappears, there is no reason to worry for the direction is clear  straigth up the mountain. This part of the trail takes you up 600 m of altitude difference within only one and half of a kilometer. On the last 100 m of altitude difference you should try to reach the right ridge, for the trail keeps on getting even steeper. The last fields of boulder should be crossed with great caution. It is essential to be sure-footed so as to avoid the risk of falling rocks. After the exhausting and adventurous ascent of 5 to 6 hours, hikers will be rewarded with a terrific view over both sides of the shores of Lake Baikal and the Ushkani Islands. Now it doesnt take long to reach the plateau to the right. There you will find various opportunities for pitching your tent which you will need to protect against the wind. Thanks to the fast-growing crippled pines you will also find some firewood. Mind that in summer you will hardly find any water there. On the plateau the way is marked by stone cairns. Just follow the eastern ridge of the plateau. Along the whole trail, you will enjoy panoramic views over the peninsula, Lake Baikal, and the Barguzin Mountains at the eastern shore. For three hours the trail leads along the ridge, passes several small mountains and hollows up to the first peak in a height of 1841 m. A small path is said to lead to a spring but it might be better to inform about its state before. For ambitious hikers, the nearby peak of the peninsula with a height of 1877 m offers another destination. ). The beautiful sandy beach of the headland, which connects Svyatoy Nos with the land, invites for swimming and relaxing. Another option would be a one-day trip to the plateau. But you should consider that this would be a long day of about 8 hours. The trip would start at the end of the tour described before and follows the trail of the second route in opposite direction up to the peak. The exhausting ascent follows a descent back to the lake on the same steep trail. If you want to walk the 2-days trip the other way round, you should know that the place on the plateau where the trail starts is only hard to find. You will need to rely on your experience and "your tummy" to find a good way downwards.